Near hind after mustang roll. Off hind after little mustang roll applied. 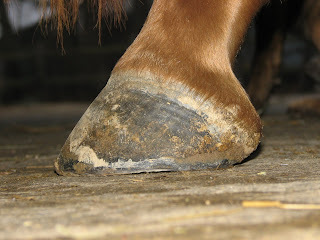 These are photos of Lutine's hind hooves on the first day that I went to see her in Jan 06. 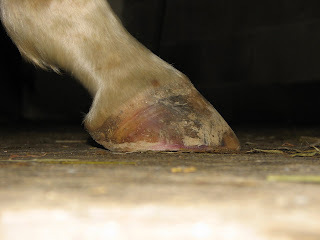 The extensive bruising was evident in all of the white hooves plus there seems to be such a clear event line and angle deviation in these two hind hooves. It does make me wonder again about whether she was, in fact, laminitic when I first went to see her. okay I comment here, but Linda is a swelling Nelly too ... sigh he hind legs as usual. I find very interesting that our mares have teh same problem at the same moment. Weather related ??? our weather is very simlar. And I could see the curvy growing lines on her hooves. I had a panic attack! It took time to grow out. Now we have found the perfect nutrition for her, the growing line on her hooves are parallels .. at last! So far the Lymph Blend and the Vit E seem to be keeping the swelling away. We've had incessant rain for the last 3 weeks now and outside the barn is like a swamp but Lutine's got hardly any puffiness around the bottom of her hind legs at all. Was Linda being overfed on cereals by the yard owner? At the time I went to see Lutine, her diet consisted of 6 - 8 litres (3/4kg) of straight rolled barley per day, with two slices of hay overnight in her stable (about 4kg of hay). During the day she was out in a paddock that was very muddy and had almost no grass to graze as such. There was a hay feeder in there but I think she was probably being bullied by the other horses and kept away from it. So it was definitely inappropriate diet that was causing a lot of problems for Lutine too. What is Linda being fed these days? Yes winter 06 Linda was fed twice of hay so between 8 to 10kg of hay per day. Then cereals already made with lots of molasses, 3kg. Now she has 4 times/day of hay, then 500g of natural cereals mix, made on site with no molasses. It made a drastic change. No grass as there is no any, just mud, mud. 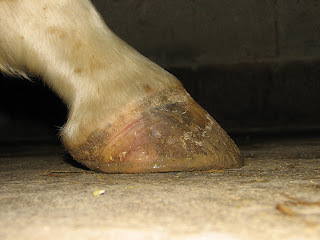 So yes, laminitis can be caused by cereals only. That's interesting Muriel as at least the 8 - 10kg would have covered the minimum of hay a horse Linda's size would need but it was the mollassed cereals that still had an effect on the feet. The forage:concentrate ratio was about 70:30 though and without exercise I can see that it could well have a big impact on her blood chemistry. So your ratios now are much improved!